You might have heard about eczema, a very common disease that causes the skin to become inflamed or irritated. Eczema is not a particular health condition. Instead, it is a reaction pattern in which the skin undergoes various diseases. Reliable eczema creams are recommended to deal with this disease, which will be reviewed in this post. It tends to start off in the form of tiny blisters which are red in color. They contain a clear liquid along with elevated plaques which are also red in color. On breaking, the skin underneath starts to ooze and weep a liquid. In older eczema and chronic eczema, the blisters are less prominent, and the skin is thickened, elevated, and scaling. There are different kinds of eczema. Perhaps, the most popular kind of eczema is atopic dermatitis or atopic eczema. Atopic refers to a group of diseases with an often inherited tendency to develop other allergic conditions, such as asthma and hay fever. Scientists have identified 11 various skin conditions that lead to eczema. However, before deciding a treatment plan, you first need to be able to differentiate between the various kinds. Before knowing about how to treat it, it’s important to know the symptoms of the disease. Regardless of the part of skin affected, eczema is normally itchy. In some cases, the itching starts long before the rashes become visible. Rashes most commonly appear on the entire face, wrists, feet, hands, and on the back of the knees. The rashes are not only limited to these parts, but they can also appear in other areas. The affected areas appear scaly, thick, and dry. People with fair skin may see the areas become red initially and then brown in color. On the other hand, in people with dark skin, eczema affects the skin pigmentation. As a result, the area affected becomes darker or lighter. Meanwhile, in infants, the rashes are itchy and produce a crusting condition that usually occurs on the scalp and face. However, patches can appear anywhere. Having awareness about the causes of eczema is also very important in order to avoid this disease. What exactly causes is not yet known; however, it is linked to the immunity system producing an overactive response when it comes to in contact with an irritant. It is this response that causes the symptoms of eczema. In some people, the rash flares up under certain conditions or when it makes contact with particular substances. For example, when some people make contact with a coarse or rough material, then the skin becomes itchy. Similarly, exposure to a few household products such as detergent or soap, feeling too cold or too hot or touching animal dander can lead to an outbreak. Other triggers include colds and respiratory infections. Moreover, stress can worsen the condition. No definite cure for eczema has been found yet; however, the disease is manageable with the help of medicines and by staying away from irritants. It isn’t contagious and does not spread. Treatment is always done after knowing what actually the disease is. We have discussed the definition, causes, and diagnosis of eczema. Now we will throw light on the information regarding treatment of eczema, a very crucial part. OTC products like the hydrocortisone 1% cream and ointments and prescriptions cream which include corticosteroids are usually prescribed to reduce inflammation. Moreover, if the area that has been affected becomes infected, then the doctor will prescribe antibiotics to kill the bacteria that caused the infection. Other treatment options also include antihistamines and tar treatments to lessen the itching and phototherapy which uses ultraviolet light to help with the itching. The drug cyclosporine is also prescribed to those people who don’t respond to all the other treatment options available. Here are some products that can help in treating eczema disease. While not a cream per se, it is mentioned due to its effectiveness. The Hydrolyzed Marine Collagen Peptide Powder is a certified nutraceutical and is helpful in skin problems like eczema. It contains collagen peptide, a natural protein that helps prevent skin folds in the dermal layers of the skin. Collagen is the structural protein that keeps skin, joints, bones, nails, and hair strong and healthy. When the body gets collagen peptide, it becomes healthier, and the skin gets firmer. The Pure Marine Collagen Powder is made not from fish scales but fish skin and can be taken by dissolving it in any drink like coffee or even water. This helps the body to absorb the collagen and derive maximum benefits from it fully. Research shows that regular intake of collagen peptide increases sports performance, helps in weight management, and is great for skin, bone and joint health. The Hydrolized Marine Collagen Peptide Powder helps to make your nails and hair grow faster and stronger. Its regular use makes the skin taut and smooth. It visibly reduces black spots and stretch marks from your body. It is especially helpful for patients suffering from eczema because it supplements the body with collagen which increases skin health. This is a natural, skin healing salve. It is a paraben free intensive treatment for eczema, psoriasis, sensitive hands, dry skin, cuticles, etc. Ora is well known for its herbal products that are made from natural ingredients with no side effects. The Natural Touchy Skin Healing Salve is best for people with sensitive skin. It is so safe that you can even use it on toddlers and newborns. It contains many herbs such as thyme, chickweed, calendula, burdock, comfrey, St.John’s wort, and plantain which possess healing properties. These herbs are great for the skin both internally and externally. They contain medicinal properties which have a drying and soothing effect on skin eruptions and irritations. It also contains organic licorice root which provides this salve with anti-inflammatory properties. These herbs make this salve best for eczema patients. Regular use of this salve has shown drastic improvements making eczema disappear and leaving the skin free from any marks. The Natural Touchy Skin Healing Salve with Paraben Free Intensive Treatment For Eczema contains no added fragrance, synthetic waxes, mineral oil, paraben, harmful chemicals, phthalates, or skin irritants that is why it is perfectly safe for people with even super sensitive skin. Contains castor oil for its soothing properties. This Mother of all creams not only replenishes and rejuvenates the skin it also helps to reduce pain and restore the damaged skin. Its regular use will decrease all your skin problems leaving your skin smooth and healthy. Its thirteen-in-one advanced formula contains all the essential vitamins, amino acids, and minerals needed for a glowing skin. It contains amaranth oil which provides quick relief to eczema patients due to its anti-inflammatory and anti-allergic properties. This amazing cream stimulates cell regeneration leaving your skin looking radiant. It repairs damaged skin and safeguards against irritations caused due to harmful chemicals found in shampoos, body wash products, soaps, etc. Made from organic and natural ingredients this cream is so mild that it can be used by children and is so effective that it brings relief to eczema patients very quickly. It forms a protective layer over the skin while nourishing damaged and inflamed the skin. 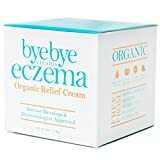 The Bye Bye Eczema cream does not contain any harmful ingredients, steroids, fillers, or fragrances. 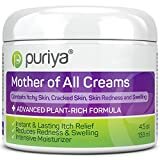 This hypoallergenic cream is rich in vitamin E, F and A which makes it ideal for people suffering from eczema, shingles, dermatitis, and psoriasis. If you want to treat eczema you need to know about the right methods. The best eczema creams mentioned above are more than capable of helping you deal with this disease in an effective manner. Go ahead and select the one that you think will work the best for you.